Sugar and spice! This unique type of pepper, measuring 20 cm, add kick and color to salads, hot sauces and chilis. 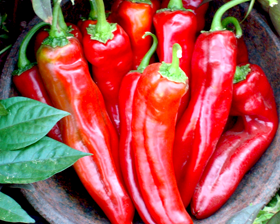 Tall plants 90-100cm produce oodles of fruit that ripens green to red, excellent fresh or cooked. Early-ripening variety great for containers and in the garden.The long, tapered fruits retain their bright red colors when dried, for festive decoration.